Four "aquanauts" returned to dry land today (June 22), after spending 12 days living on the ocean floor off the Florida coast as part of a NASA-led mock mission to an asteroid. The undersea explorers wrapped up the 16th expedition of the NASA Extreme Environment Mission Operations Program, or NEEMO 16 this morning, emerging from the water at 9:11 a.m. EDT (1311 GMT), NASA officials confirmed. "The NEEMO 16 crew is back on the surface, heading back to land! Splash up time was 9:11 am ET," mission controllers relayed via Twitter. During the 12-day mission, the aquanauts lived at the National Oceanic and Atmospheric Administration's Aquarius Underwater Laboratory, which lies 62 feet (19 meters) below the ocean's surface, roughly 3.5 miles (5.6 kilometers) off the coast of Key Largo in the Florida Keys. 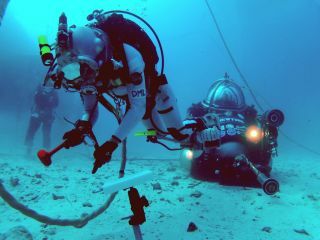 The NEEMO 16 expedition was designed to simulate aspects of a real mission to an asteroid, focusing in particular on the most effective ways to fasten to a space rock and how to cope with communication delays with mission control, NASA officials said. The aquanauts also performed several mock spacewalks to test different techniques for attaching to, and navigating around, on an asteroid. This work will help NASA plan a future manned mission to a near-Earth asteroid, which was one of the top goals assigned to the agency by President Barack Obama in 2010. As outlined in his directive, NASA is aiming to send astronauts to an asteroid by 2025, then on to Mars by the mid-2030s. The NEEMO 16 crew was made up of astronaut Dottie M. Metcalf-Lindenburger, Japanese astronaut Kimiya Yui, European Space Agency astronaut Timothy Peake and Cornell University professor Steven Squyres, who is the lead scientist for NASA's Spirit and Opportunity Mars rovers. The 81-ton Aquarius research station measures 43 feet by 20 feet by 16.5 feet (13 by 6 by 5 meters). The underwater outpost has six bunk beds, a shower, toilet, kitchen and computers. Aquarius is owned by the National Oceanic and Atmospheric Administration (NOAA), and managed by the University of North Carolina at Wilmington. Aquarius is the world's only undersea research station, according to NASA, but it is in danger of being shut down in 2013. An organization, called One World One Ocean, has initiated a campaign to save the laboratory from being axed due to NOAA's budget consolidation.